Set in a crescent-shaped bay, San Juan del Sur has become known as a popular surfing spot and coastal holiday destination for Nicaraguan families and international visitors alike. 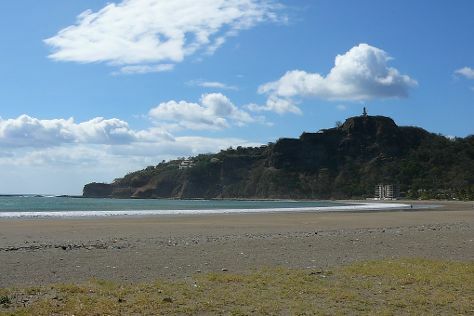 Visiting San Juan del Sur Beach and La Flor Beach Natural Reserve will get you outdoors. Step out of San Juan del Sur to go to Moyogalpa and see Isla Ometepe, which is approximately 1:50 hours away. There's more to do: trot along with a tour on horseback. To see reviews, maps, traveler tips, and more tourist information, go to the San Juan del Sur trip itinerary maker. Toronto, Canada to San Juan del Sur is an approximately 18.5-hour flight. Traveling from Toronto to San Juan del Sur, you'll gain 1 hour due to the time zone difference. Prepare for much hotter weather when traveling from Toronto in March: high temperatures in San Juan del Sur hover around 36°C and lows are around 29°C. You will leave for Granada on the 21st (Tue). The lakeside city of Granada has the look and feel of a historically important economic and political center, with grand colonial architecture, a unified look, and many cultural attractions. Your day-by-day itinerary now includes Mombacho Volcano National Preserve as well as Iglesia de La Merced. Start off your visit on the 21st (Tue): take in the architecture and atmosphere at Iglesia de La Merced and then see the interesting displays at ChocoMuseo. Here are some ideas for day two: get impressive views of Mombacho Volcano National Preserve and then step off the mainland to explore Islets of Granada. For more things to do, maps, photos, and more tourist information, read Granada holiday planner. You can take a shuttle from San Juan del Sur to Granada in 1.5 hours. Alternatively, you can drive. In March, plan for daily highs up to 39°C, and evening lows to 26°C. On the 23rd (Thu), you're off tohome.